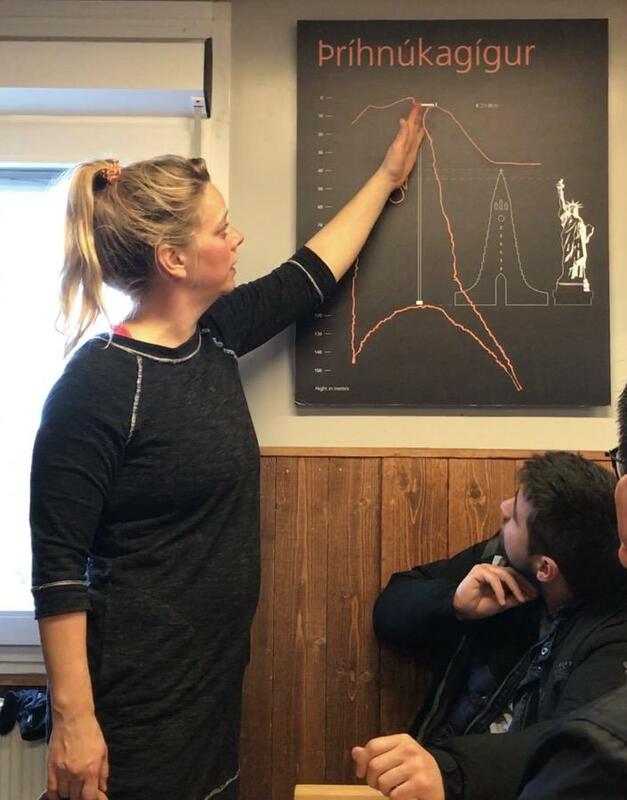 From the moment I found out about the opportunity to go inside a volcano in Iceland, I knew this was something I had to do during my year of adventure. I’d climbed countless mountains and seen the world from above, but from the inside out? That was something completely new. 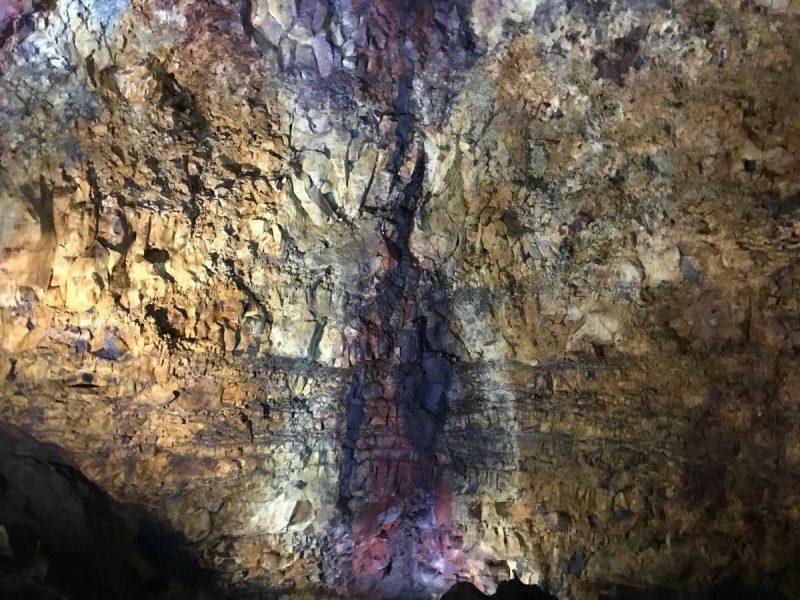 This is one of the only places in the world where you can enter a volcano, and the only place where you’ll find a perfectly preserved magma chamber inside. 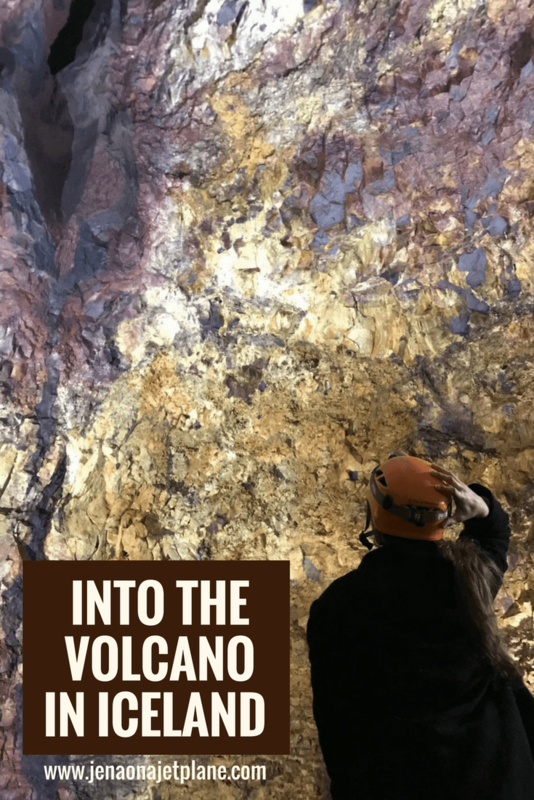 Science nerds and adventure lovers alike will gawk at the stunning geology and get a rush out of descending 120 meters into the Thrihnukagigur chamber. The opening was found by chance just a few decades ago, and extends deep enough to fit the Statue of Liberty! For those who are wondering, the volcano is safely dormant, not having erupted in more than 4,000 years. The volcano is located midway between Reykjavik and the Golden Circle, and takes about a half hour to reach by van. Once there, two hikes await you. The first is to base camp at the bottom of the volcano, which takes about 45 minutes. Afterwards, it’s a short 3-5 minute hike up to the entrance of the crater, where you’ll catch an open-air elevator down the shaft. The landscape as you’re walking to the volcano is lush and untamed, with fields of green spanning as far as the eye can see. Unfortunately, we had bad weather on our tour so our group had to walk in the rain. Thankfully, the staff was prepared with full-body rain jackets, in a stylish neon yellow color. We walked single-file towards the volcano, and were greeted with hot beverages at base camp. 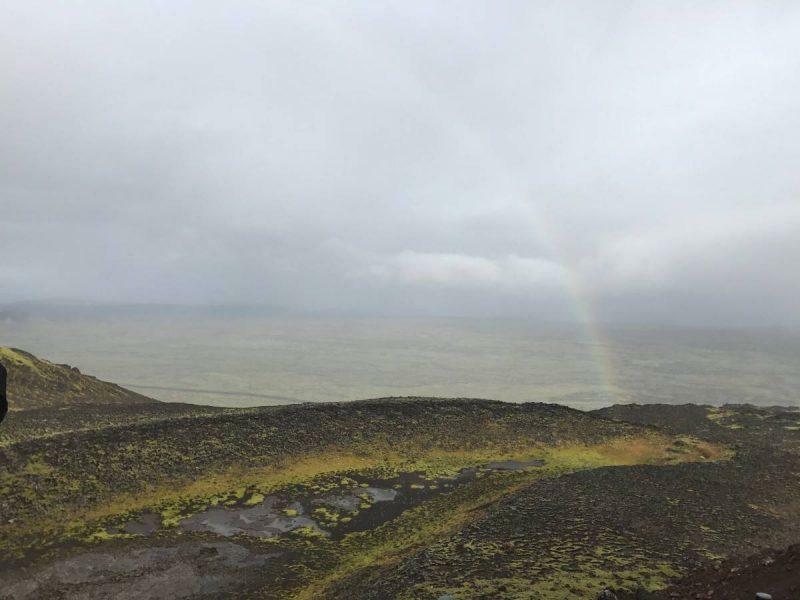 We also got to see a stunning rainbow just as we were about to descend into the chamber, a sign of good luck and a happy reward after our rainy trek. I was able to visit Thrihnukagigur on an Inside the Volcano tour. Those driving the Ring Road and taking a do-it-yourself approach to the country may be saddened to hear that you’re unable to access the volcano without a guide. You might be tempted to try, but it’s best to be led by experts the entire time, otherwise it could be dangerous. With the proper precautions, the entire experience is perfectly safe and suitable for all ages and levels of experience. You’ll be provided with a hard hat at base camp, and a bandana to help keep it in place. 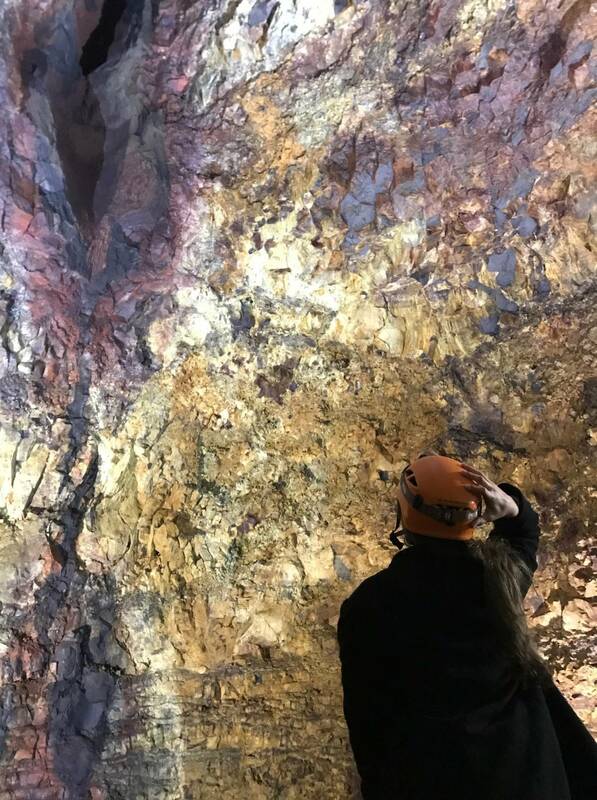 The helmet has a light attached, which you can utilize to navigate your way around the cavern, even though there is enough light shining in through the opening to walk around with ease. Make sure you turn your light off for pictures to avoid a glare. You can take as many photos as you’d like, just be careful where you step as there are no paved areas. Also, please be respectful of the space and leave everything where you found it. The “hidden people” in Iceland don’t take kindly to thieves. The volcano was named after Arni B. Stefansson, the first to explore the crater and an advocate for opening it to the public. Tours only recently began a few years ago, and the phenomenon is a geological oddity. The magma chamber is where the liquid rock waits to erupt and, in most cases, the crater is closed after the eruption by cold, hard lava. Thrihnukagigur volcano is the exception, because there’s no molten, steaming lava in the chamber waiting to blow. The magma is thought to have solidified in the walls or rescinded into the earth. The chamber is filled with fiery, volcanic colors as a result of gases mixed with the magma. The sediments are glazed into the walls like one of Mother Nature’s secret paintings. The tour departs from Iceland at several times throughout the day. I chose to go with the first group in the morning, and found that despite the weather the supplies at base camp were fully stocked and there were less people traversing in and out than when we were leaving. I would recommend an early departure if possible. The whole experience takes about 4 hours, and you’ll be back in Iceland in time for lunch if you leave first thing in the morning. Your tour guide will be available to answer questions. You get about 20 minutes to walk around the cavern before taking the elevator shaft back up. After the tour, you’re treated to hot soup and get a chance to warm up by the radiator before beginning your trek back to the buses. There are no shortage of adventures in Iceland, but this one made it to the top of my list, and it should be on the top of yours as well. It’s not every day you get to journey to the center of the earth, and it’s a trip worth making! *Disclosure: I was provided with complimentary admission on my volcano tour. All opinions, once-in-a-lifetime experiences and memories are my own. I have always been fascinated by volcanoes so I would jump at the chance to go inside one! Such a cool idea to go on a tour of one. I also love that the tour company outfits you with proper gear for bad weather so you can enjoy your day more! Yes, yes, YES!! I have got to do this!! Iceland keeps popping up on my radar, but this post just sealed the deal. I am fascinated by volcanoes and can’t wait to venture inside one. Thanks for sharing this! I haven’t been inside a volcano before and this sure looks like a thing that I’d do! But I’m going in December don’t think I’ll get the chance to see this place this time around. I am not sure this is something I would do, but it is fascinating to read about. Volcanoes freak me out a bit! I will visit Iceland and let my hubby do that part of the trip! I’ve never been INSIDE a volcano, I’d be a little scared! Did you dive along the Silfra crack while you were in Iceland? I didn’t know you can go inside a volcano! This is such a unique experience. I will consider this when I visit Iceland! Science nerds raise your hands! Me! I want to see the inside of a volcano! What a cool experience, Jen — I would love to do this. 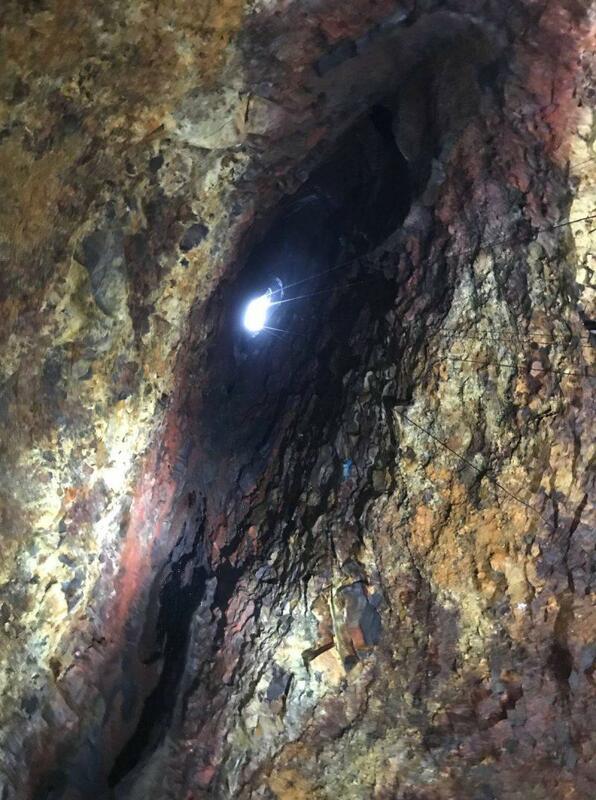 Great photographs, thanks for taking us inside the magma chamber.